1. Boil the potatoes in slightly salted water until tender. Drain and mash the potatoes until they are as lump free as possible. 2. While the potatoes are cooking, gently toast the chopped walnuts in a dry frying pan taking care not to burn. In the same pan cook the pancetta in a little olive oil until crisp, remove from and place on to kitchen roll until needed. 3. Spoon the mash into a large mixing bowl, season with salt and pepper then add the sage and plain flour, using a wooden spoon mix to form a dough. Knead for a couple of minutes. 4. Split the dough in half and roll both into a long sausage about 2cm thick. Cut the sausage into 3cm pieces and if you have time gently press each gnocchi with the back of a fork for an authentic look. 5. Bring a pan of salted water to the boil and add the gnocchi in batches. When the gnocchi rise to the top scoop out with a slotted spoon and transfer to a large serving bowl. 6. 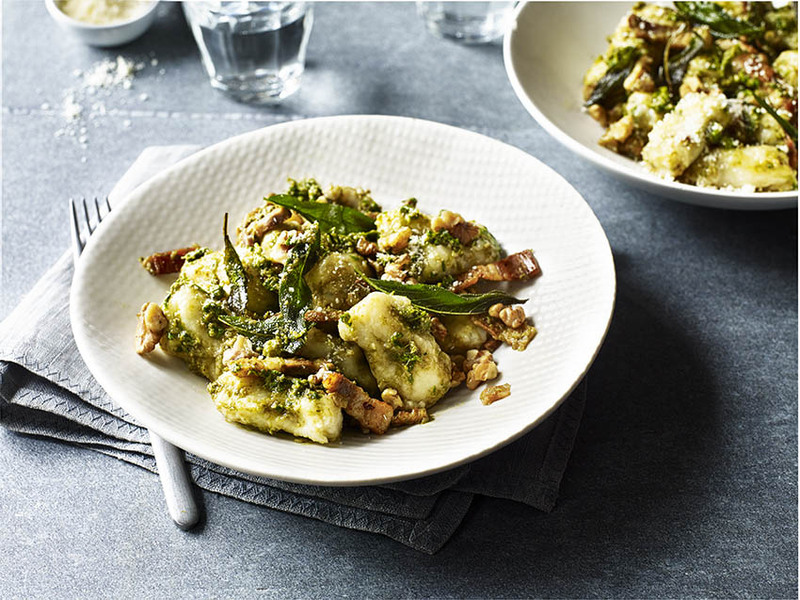 When all the gnocchi are cooked, toss in the pesto and serve with a sprinkling of the toasted walnuts and pancetta. If you have some Parmesan in the fridge feel free to grate a little over and enjoy.